A guide to Puccini's final opera. Princess Turandot of China has sworn that any man who wishes to marry her must answer correctly three riddles – if he fails he will be executed. Can the exiled Prince Calaf triumph and make the ice princess love him? 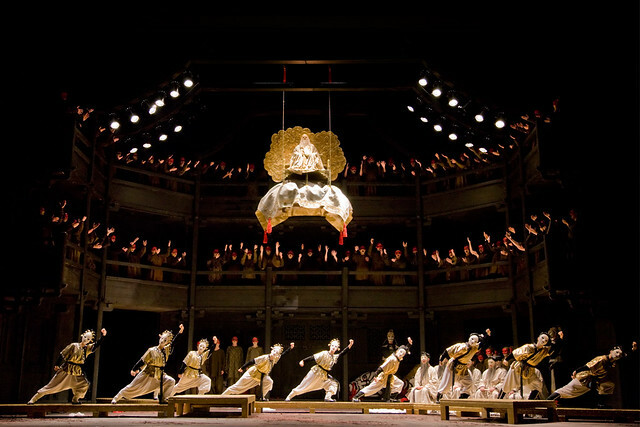 Andrei Serban’s classic production of Turandot (first performed by The Royal Opera in 1984) highlights the violence and beauty of ancient China. Spectacular effects include the arrival of dancers riding on a painted Chinese dragon and waving bloody daggers for the Act I execution, and the entrance of Emperor Altoum, who descends from the sky on a golden throne, in Act II. In Act III Turandot symbolically discards her sinister mask to show that she is conquered by love. Puccini began work on Turandot in 1920. As always, he played a key role in shaping the opera’s libretto. He worked with great enthusiasm on the score and by March 1924 it was all but complete – apart from the final love duet. This duet caused Puccini much grief and he was still struggling with it when he died in November 1924. The opera was completed by Franco Alfano and received its premiere on 25 April 1926 at La Scala, Milan. Puccini’s principal source for Turandot was Carlo Gozzi’s 1762 play of the same name. Gozzi took a rather satirical view of the story (echoed in Busoni’s 1917 opera Turandot). Puccini followed Schiller’s adaptation of Gozzi’s play in making Calaf a heroic figure, and in having Calaf and Turandot genuinely come to love each other. Puccini was keen to include authentic Chinese material in his score for Turandot. The opera makes use of several Chinese folk melodies, including an ‘ancient Imperial Hymn’ that Puccini first heard played on a Chinese musical box owned by an Italian aristocrat. Puccini’s talents as a melodist are very clear in his final opera and Turandot contains some of his most memorable arias, including Calaf’s ‘Nessun dorma’, Liù’s ‘Signore, ascolta’ and ‘Tu, che di gel sei cinta’ and Turandot’s dramatic ‘In questa reggia’. I saw Turandot last night in a cinema in Worthing and thought it was fantastic. The back stage interviews were really interesting and added to the enjoyment of the opera. I think the camerawork was first class with the close ups of masks etc. it really was a superb production. Your article was also very informative and interesting and I will make sure I read your next article before I see the next opera, hopefully very soon!